The wind came, a sirocco, an African wind that crosses the Mediterranean and blows sometimes for days, driving people a little crazy with its relentless howling. It starts innocently enough and then just keeps coming until you can’t stand it anymore. Here at the beginning of the blow it darkened the skies and carried a smell on the air that might have been some of the desert’s dust still bearing the arid scent of ancient sea bottom. Photographing the elements is something I have been trying to do for a while, but in another form, simpler, purer, without the horizon to make it familiar, just the phenomena of each of the elements. It’s not been easy to make them interesting, but I still work on it whenever the potential image appears. Yet, when the wind blows and the sky goes heavy I respond wherever I am, because that is all we can do; to try to be in the moment, in the place where we find ourselves. 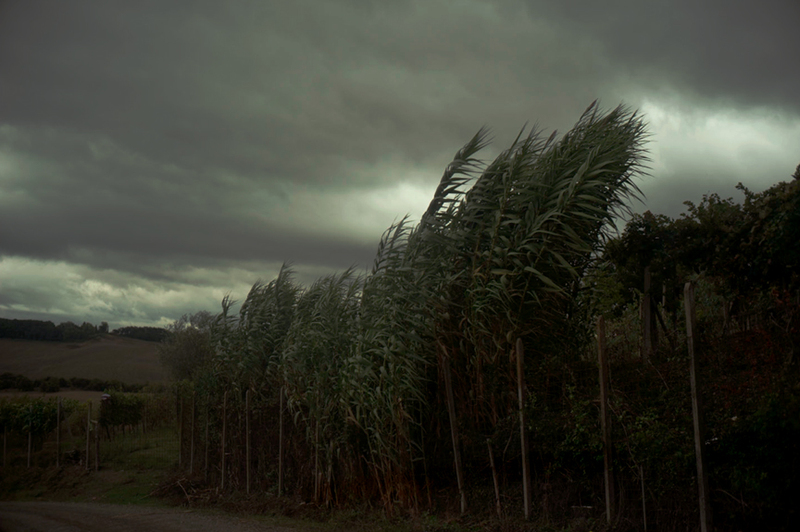 This entry was posted in Elements, Tuscany, Weather and tagged Elements, Landscape, Tuscany, Wind on September 28, 2015 by joelmeyerowitz2014. Looking at your images gives me the confidence to shoot more of my own. Watched a video of you talking about shooting street. This image, just a different street.